It was Sunday, Sept. 11, 2011, and I was walking down to the Festival district with Marty Mapes, founder of Movie Habit and the catalyst behind my Toronto trip. Marty asked me about the comfort of my shoes. I was wearing black steel-toed Doc Martens. They’re the artsiest shoes I own, given the only other pairs in the closet are brown Borns (extremely comfortable) and the third pair are runners (far too informal). I commented that, while the Doc Martens aren’t ideal for extended walking, they’re the only pair I have that’s stylish for a film festival environment. Plus, much more importantly, they’re the only pair I have that goes well with both my blue jeans and my black jeans. After all, you can’t look cool wearing brown shoes with black pants. Having recounted this story a number of times now, this is when people invariably comment that all this shoe talk makes me sound like a girl. Well, that’s also when I get to deliver the punchline. That very same day was Francis Ford Coppola’s “Mavericks” event, a public question-and-answer session in which those lucky enough to have ducats were able to see the great filmmaker in person. First off, it has to be said Coppola is absolutely a top-of-the-line human being. He is so nice and interested in what people have to say and the questions they have to ask. Rather than recounting tales about the movies he’s made, Coppola engaged the audience in a conversation that mattered to them and, in turn, kept himself stimulated. One extremely telling indication as to where his heart is came when he was asked to give some advice about writing. His immediate response was to suggest writing first thing in the morning, while your mind is fresh and before people get the chance to hurt your feelings. The punchline to my shoe story is this: As soon as Coppola stepped onto the stage, the first thing he did was acknowledge a fashion faux pas. “I’m very embarrassed. I left my black shoes on the plane,” he said. Coppola provided a glimpse into the genesis of his latest movie, Twixt. It all started with a trip to Istanbul, in search of cost-effective locations at which to make a new movie. After an evening of raki, perhaps a tad too much raki, Coppola was swept up in a gothic dream in which Edgar Allan Poe makes an appearance. Awakened by the sounds of the morning prayers in Istanbul, Coppola dictated the dream into his smartphone and Twixt was born. As an added bonus for his Turkish excursion, he realized he could film this new story right in his own backyard of Napa Valley. Here’s to Blood in Your Lap! During the Mavericks session, Coppola commented that 3-D was absolutely not the future of movies. He does see the digital era ushering in new, unexplored opportunities, but not 3-D. The 3-D trickery has already had three or four forays into the mainstream, with even Hitchcock noting it’s a nine-day phenomenon. Adding some sting to that comment is the notion that Hitchcock made Dial “M” for Murder on 3-D’s “ninth day,” with virtually nobody seeing the movie in that extra-dimensional format. The irony of this is that Twixt, purely in fun and as a jab at 3-D gimmickry, sports a couple climactic scenes in 3-D. And they’re really, really good 3-D scenes. It’s the kind of throwback, blood-in-your-lap 3-D that stands out exactly the way 3-D should but so rarely does these days. As for those digital possibilities, Coppola foresees a fairly fanciful future wherein cinema meets performance art. Directors might tour with their new movie, bring along the score composer, and customize the storytelling by shuffling around digital files based on the audience’s reactions. That’s one possibility. But the excitement is in the talent out there making movies now and the stories their grandchildren will be filming in the coming decades. Given the way perceptions of movies shift over time, changed by culture, audiences, personal experiences, and reflection, Coppola can only wonder how Twixt and Tetro will be appreciated 30 years from now, much like how 30 years ago Frank Rich vilified Apocalypse Now and dubbed it the biggest disaster of the preceding 40 years of film. “I thought, ‘Gee, you mean there was nothing worse in 40 years? What about some of those other movies, they’re not worse than Apocalypse Now?’” Coppola recalled of his reaction to Rich’s screed. Coppola provided some terrific insight into writing and his approach. His roommate asked him how he knew he had no talent - you have to try it first. 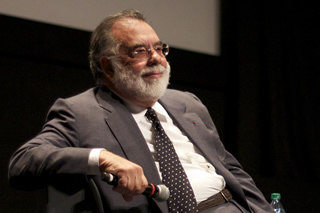 Nonetheless, as a drama student, Coppola’s lack of writing confidence led him into directing. Coppola works in a comfortable environment, coffee and a Carmine cigar at the ready. “I believe there is a hormone that is injected in the blood of the young writer that makes him hate everything he’s just written,” Coppola said. So the best approach is to get the first six to eight pages written, then put them away and keep going. Once there’s a sense of completion, after 80 or 90 pages, go back and review the entire screenplay and see what works, what moves you, what touches. At that point there will be a distance between you and those first pages that might otherwise have been deleted, thereby creating a cycle of rework that might well prove unproductive depending on where the subsequent pages take you. Coppola went on to provide a priceless piece of advice, one relating back to his work on Patton, for which he received the Oscar for Best Screenplay. For one thing, when the studio asked him, at the age of 24, if he had any military experience, he said, “Yes.” That experience? Well, he was kicked out of military school, but, for all they needed to know, that certainly counted as a military experience. The first attempt at a Patton movie, starring Burt Lancaster, led to Coppola’s script being lambasted. It was all wrong. The production moved ahead without him even knowing his script wasn’t going to be used. Then, four or five years later, George C. Scott was brought on board as the new lead. Scott didn’t like the screenplay they were working with and Coppola’s script was revisited.